The rapid rate of development of mushroom production technology from a primitive cave culture in France to a hightech industry during the last three centuries is a success story which has kept pace with the ever-increasing demand for this commodity and there is every reason to be optimistic about its further growth in the years to come (Rai and Verma 1997). From a meager 2 million tonnes in 1986, the world mushroom production has registered a 3-fold increase in a decade and was about six million tonnes in 1997, and five mushrooms, namely A. bisporus, Pleurotus spp., V. volvacea, L. edodes and Auricularia spp., the so-called leaders, accounted for 82 per cent of the total mushroom production (Table 1). It is clear that the button mushroom (A. bisporus) is still the leader contributing 31.8% to the total mushroom production but its share that was 56.2% in 1986 has decreased over the years. China is the biggest producer of Lentinula, Pleurotus, Auricularia, Volvariella, Flammulina, and Tremella. Indonesia and Thailand are the other major producers of Volvariella. 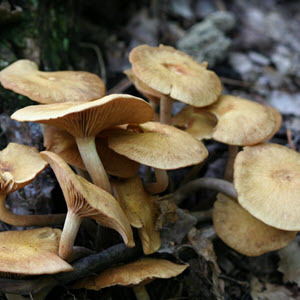 Japan produces significant quantities of Lentinula and Flammulina and almost the whole quantity of Hypsizygus and Grifola produced in the world. Agaricus production is concentrated in three geographical regions—Europe, North America, and East Asia. In Europe, Netherlands, France, and UK; in America, USA and Canada, and in East Asia, besides the giant China, Indonesia and Taiwan are the other major producers of this mushroom. Asia accounts for major share of US imports. It is quite interesting that six countries called group of six or G-6 countries (USA, Germany, UK, France, Italy, and Canada) account for more than 80% of world consumption; per capita consumption in these countries is very high (2-3 Kg). One important indicator of demand for mushroom is the income level of populace in the G-6 nations. Rise in income level is a global phenomenon and the demand for mushrooms is expected to grow at a much faster rate.